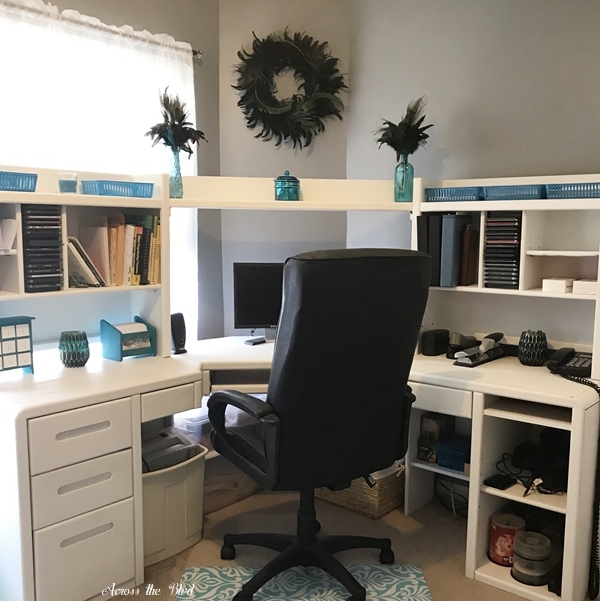 Nearing the end of summer, I was in the middle of giving a makeover to my craft room / office space. I completed the room makeover, but then it was time to start posting Halloween, Autumn, Thanksgiving, and Christmas posts. So, my room makeover posts went into the queue for later posting. 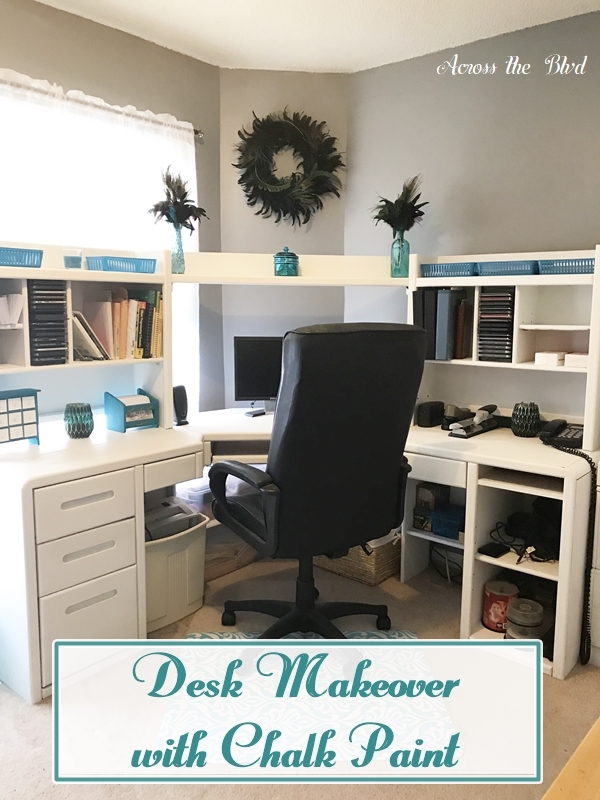 Since the makeover was not only for aesthetic purposes, but also for organization and utilization of the space more efficiently, starting off the new year with this Large Desk Makeover with Chalk Paint post seems like a good idea. I began the room makeover by giving a makeover to a few thrift store finds. If you’d like to read the details of these makeovers, the links are included. The Personalized Peacock Decor Wall Art was an easy way to update a frame using paint, card stock, and a wooden letter. I used a couple of thrift store frames to create Simple DIY Peacock Decor. I found a small table at Goodwill to use as a Printer Stand. Some fresh paint was all it needed to fit in well in the room. I transformed an old desk that I’ve had for years by painting it. I love the pops of peacock colors on it. One of my favorite thrift store finds was a Lazy Susan. I painted it and added some dollar store containers to it for easy access to lots of items that I use frequently. I found a letter holder at Goodwill and gave it a peacock makeover, too. I’m using it as a card holder. Another Goodwill find was this small tabletop storage chest. I didn’t write a post about it because all I did was paint the outer part with the peacock paint and the drawers with white paint. It’s great for holding pins, tacks, buttons, and other small items I use frequently when crafting. 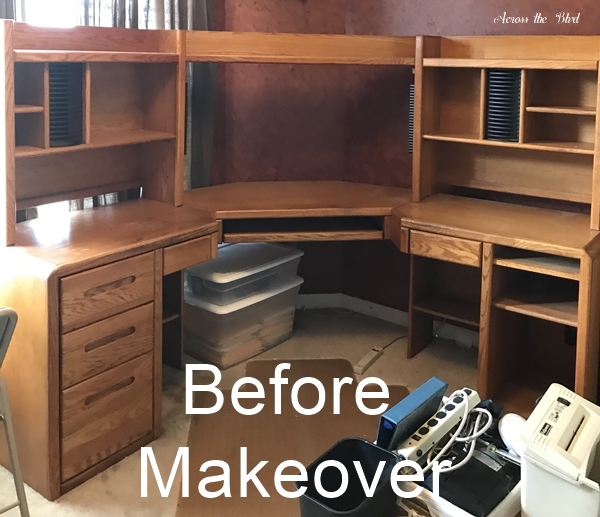 One of the last pieces to get a makeover was a very large desk that we’ve had for years. Before its makeover, the desk was functional, but the wood didn’t fit in with the new look of the space. I used the same Art Minds Chalk Paint in Porcelain that I used for the small desk and computer stand. I thought of giving the desk some accents using the peacock paint, but decided that with the accessories I would be adding to the desk, going with all white worked best. 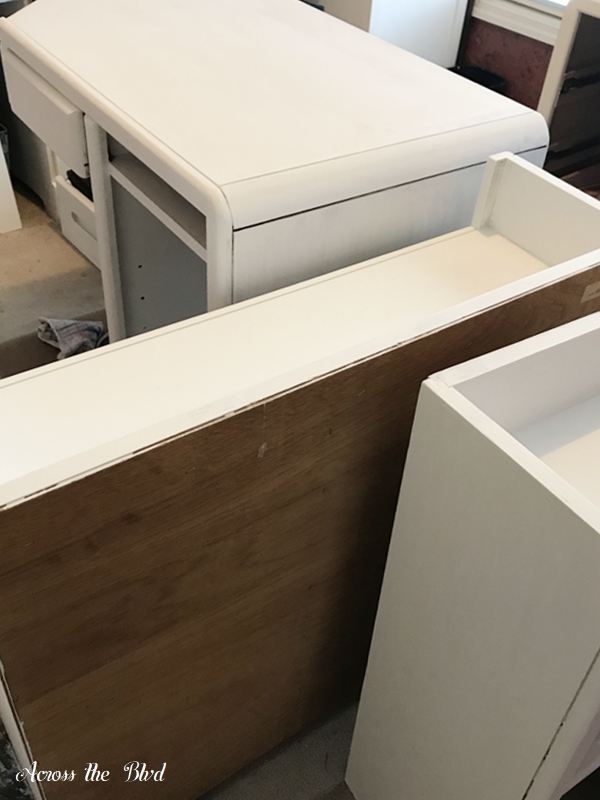 The desk can be taken apart and separated into several pieces. This made it easier to get into all the nooks and slots of the desk. Before painting it, I cleaned it with TSP. It took two coats of paint to get the coverage I wanted. Once the paint was dry, I used Minwax Clear Satin Polycrylic Protective Finish Spray to seal the desk. Taking it apart wasn’t too difficult, but putting it back together turned out to be a bit time consuming. Thank goodness my husband offered to assist! You can see in this photo that the walls got a paint job, too. I’ll share the details on that along with some storage and organization ideas when I post the final reveal of the room. I’m enjoying the new brighter look of the room. The dark Tuscan feel was dated and didn’t work well for a creative space. Even though tackling this large desk was a little daunting, I’m so glad that I gave it a new look. Beverly, your space is awesome. You did a lot of work in your craft room. Wow to the new look of the big desk. Sounds like a lot of work and the outcome is beautiful. I always love your colors. STay warm! Thank you, Shirley! It was a lot of work, but I’m pretty pleased with how the desk turned out. It’s turned into a bright and cherry space in which to work now. We stayed warm by pretty much staying indoors. A few brief jaunts out in the snow to take some pictures was all I could manage! Crazy weather for Charleston and it still hasn’t melted. Temps won’t stay above freezing long enough until Monday to let it melt. Super pretty and i love the peacock theme. that desk was a huge undertaking – i know what you mean about getting it back together – that seems to always be an issue for me! Love the lazy susan idea and i recognize that turquoise beaded trim . . . I bought a ton of that at the dollar store – so pretty! 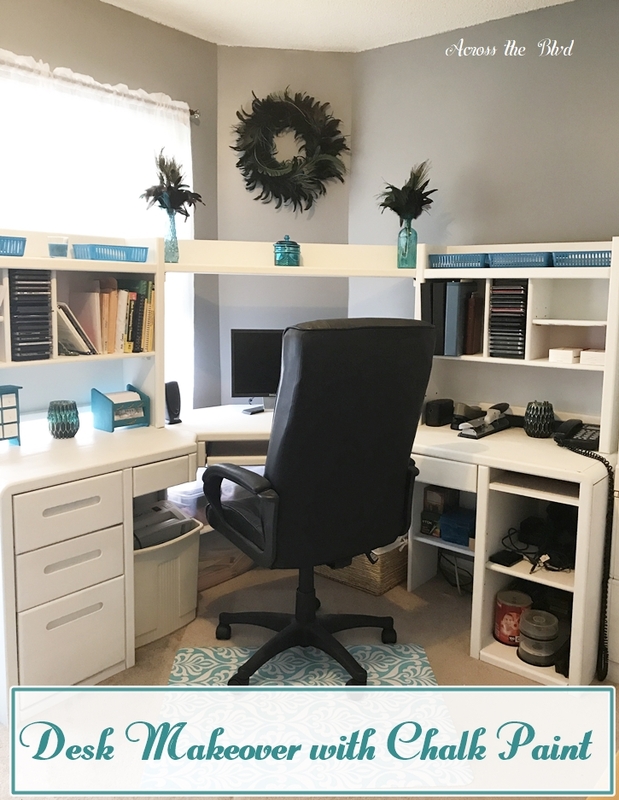 i was thinking my office/craft room didn’t need a makeover until I saw yours! Thanks so much, Lauren! It was frustrating when trying to put it back together! Knowing that it should all fit like a puzzle, but having it be off my an inch or so here or there was a bear! I love the dollar store for items like that trim. beautiful, bright and airy. Looks like a lot of work went into it. Great ways to repurpose items. everything looks brand new. Thank you, Debbie! I’m enjoying the new look of the space and repurposing items is always a good way to go for me. Great inspiration! Enjoy your Sunday! Your desk makeover looks great! Thank you, Angela! I’m really happy with how the desk turned out. Your desk makeover came out beautiful! Thanks for sharing this at Cooking and Crafting with J&J. Thank you, Julie! Thanks for hosting the party! Ha! I’m in the midst of redoing another room at our house. It seems like there’s always something that’s in need of a makeover! Thanks for the party, Carrie! Beverly, your room is very impressive! Love the colors and all the thrift store upcycles! The lazy susan caught my eye immediately. That’s a great thing for a desk…never thought of it used that way! I would love to have that spacious desk to work in and to have all that wonderful room you’ve got. Love that little desk too. Got one nearly like it sitting in the basement if I can ever get time to give it a makeover. Thank you, Florence! I’m loving the colors, too. It’s amazing what a little paint can do for thrift store items. The lazy susan is one of my favorite and most useful items that I’ve given a new purpose to. I do enjoy having the space to work in. There’s always something that needs a makeover, isn’t there? Beverly, I love the new look! So bright and fresh! This was quite a project you took on and the results are fantastic. I bet you’re thrilled with the results. It really looks great. Pinned and shared. Thank you, Laurie! I am very happy with it. I debated over painting it. I knew the old look wouldn’t fit in with the new look of the space, but I dreaded taking on the project. It wasn’t nearly as difficult as I expected though. Using chalk paint was the way to go for this. Thanks for sharing!